How do I add video, images, and hyperlinks to my guidelines? Easily insert visual media and links into your organization's guidelines using our text editor. Submittable enables you to add video, images, and hyperlinks to your organization's General Guidelines and individual form guidelines with a user-friendly text editor. The text editor is a WYSIWYG (What You See Is What You Get) tool, so that what you see in the text editor will reflect how it appears in your guidelines. To edit your General Guidelines, click on Forms and select Edit General Guidelines on the left side of the page. In the Public Profile page, locate the text editor in the General Guidelines section. To edit a form's guidelines, go to Forms and click the name of the form you'd like to edit. In the General Settings tab, locate the text editor in the Guidelines section. In the text editor for your General Guidelines or form guidelines, click on the image icon. 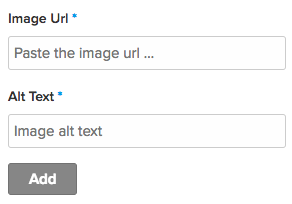 You will see a dropdown box asking you to enter an image URL and alt text for the image. Paste the Image Address into the Image URL textbox. The Alt Text box enables you to include a description of your image, which helps ensure your guidelines are as accessible as possible. For example, if your picture is of horses running in a field, write "horses running in a field" in the Alt Text Area. Click the Add button and your image will appear in the guidelines area. Click Update Profile or Save Form to save your changes. In the text editor for your General Guidelines or form guidelines, click on the video icon. You will see a dropdown box asking you to enter a video URL. Paste your video URL into the text box and click the Add button. Click Update Profile or Save Form to save your changes. In the text editor for your General Guidelines or form guidelines, click on the link icon. Enter the URL for the link you want to include and press enter on your keyboard. Click Update Profile or Save Form to save your changes.